If PMI-PBA certification is in your future, then so is the application process. Fortunately, PMI has greatly improved the application process over the years, at least regarding the ease of using the online application process. Nevertheless, there is still a bit of work to getting the application completed, submitted, and test scheduled before you are ready to actually take the test. This article is intended for anyone who is contemplating pursuing the PMI-PBA and wants to get an idea of what’s involved in the application process prior to taking the test. Here I lay out the steps in the application process to help candidates know what to expect in order to make the process as efficient as possible. That should free up energy to enable candidates to concentrate their efforts on studying to pass the exam. First, it’s helpful to remember that taking the test is only one step to becoming certified. PMI certification also requires demonstration of experience and education, as well as commitment to legal and ethical practice. Although those are often thought of as simply requirements for getting approval to take the test, they really are qualifications for certification. So while all the details and work it takes to complete the application may be a bit tiresome, it is good to maintain the quality of the certification program and the value of PMI certifications. See our PMI-PBA FAQs page for answers to some of the most common questions. Get your resources organized. Visit the PMI-PBA Application page as your “home” for applying for the PBA. It has links to the online application and other useful information. There you will find the PMI-PBA Certification Handbook which is a handy download, rich with details about everything related to PBA certification, from the timeline of the process, to submitting payment, to what happens with an audit, to scheduling your exam, and more.Download the Watermark PBA Application Worksheet to help you get your education and experience details organized. This will make it much, much easier once you get to the PMI application. Note that this worksheet is for your assistance only; it is not officially part of the application. Start your online application. You will need to log in to PMI.org with your PMI ID and password, or sign up if you don’t already have one. You do not need to be a member of PMI to apply, but it makes sense to do so given the lower cost of taking the test at the member rate (see more below).Once you start your application, you will have 90 days to complete it. PMI will send reminders and it’s really quite easy to access it for updating until it is complete. If you don’t complete the application within 90 days and it expires, you may reopen the application and your information will still be there so you won’t lose anything.The sequence below is optional as you may go to any section of the application at any point as necessary. Complete the general information. The first section will include entering general information, including home and work contact information. You will then need to enter education background, such as high school diploma or college degree. Enter business analysis education (contact hours). Enter your information about education that you have had in the area of business analysis. You will need to provide the name of the course, the school or institution (such as Watermark), the date it was taken, and the hours earned. The topics can include anything related to business analysis methodologies, principles, and practices. Be aware that if you get audited, you may need to provide a transcript or evidence that you took the course. Your contact hours will need to total 35. There is no time limit, although more recent classes may be easier to verify if you get audited. Watermark certificates of completion work well for PMI audits. 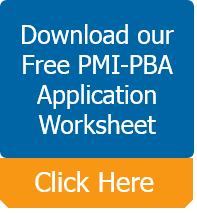 Get a copy of our FREE PMI-PBA application worksheet! Complete the business analysis experience This section details your business analysis experience. It’s really not that difficult, although it does take some time. Contact name, email, and phone number for someone who can verify that you did the business analysis work you are claiming. Be aware that if you get audited, you will need to get in touch with your contact and they will need to sign something that confirms that you did the work as claimed. Number of hours in each of the five domains: Needs Assessment, Planning, Analysis, Traceability and Monitoring, and Solution Evaluation. Brief description (550 characters maximum) of business analysis work done. Note that the biggest challenge in the application process may be condensing your description of your project into 550 characters (including spaces!). You will need to demonstrate 7,500 hours of BA experience within the past 8 years. You will need to demonstrate 4,500 hours of BA experience within the past 8 years. Review and agree to the PMI Code of Ethics and Professional Conduct. Part of completing the application, or joining PMI (whichever comes first), will include agreeing to abide by the PMI Code of Ethics and Professional Conduct. Technically, this amounts to checking a box like a software license agreement. Of course, it is important so be sure you read and understand the contents. You may be randomly selected for audit. If you are selected, then you will have 90 days to send in your audit materials. The burden of an audit is largely dependent on how easy it is to get in touch with your contacts and get transcripts/certificates of completion for your contact hours. Once they receive your materials, PMI processes the audit pretty quickly – within a week. Audits are random and we have had many students get audited. In general, our students’ feedback has been that it is not particularly onerous. After they receive payment and you’ve passed the audit (if you get audited), you will receive an email from PMI indicating that you are eligible to take the exam. Included in the email will be a PMI Eligibility ID, which you will use when going online at Prometric to schedule your exam. There you navigate through their website to find a location and exam date/time that works for you and schedule your test. Getting your PMI-PBA certification is a worthwhile and rewarding experience. It won’t happen without some effort, however, including the application process. Fortunately, PMI makes it pretty easy, so don’t let the application deter you from pursuing this professional development goal. Good luck in getting your PBA! PMI and PMI-PBA are registered trademarks of Project Management Institute.